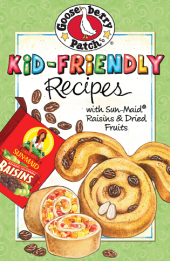 Shakin & Bakin Foodie Blog: FREE Goose Berry Patch & Sun-maid Raisins Cookbook! FREE Goose Berry Patch & Sun-maid Raisins Cookbook! FREE COOKBOOK ALERT! Hurry and grab this one while you can as it's only while supplies last and/or for a limited time!!! Download or order your free Cookbook from our friends at Sun-Maid, packed with 30 kid-friendly recipes using the wholesome ingredients moms love! Available as a FREE PDF download or you can order the printed book while supplies last! This handy cookbook features 30 family friendly recipes, along with plenty of tips and easy ideas for getting kids to try new foods. Your family's new favorites are inside! In a bowl, stir together baking mix, raisins, sour cream and milk until just combined. Gently gather dough into a ball on a floured tea towel. Knead 10 times. Roll out dough into a 12” x 10” rectangle. Spread dough with butter. Mix together brown sugar, nuts and cinnamon; sprinkle over dough. Starting at a long end, roll up dough tightly. Cut roll into 12 slices. Place 6 slices, cut-side down, on a greased baking sheet about 3 inches apart. Unroll remaining 6 rolls and place on cookie sheet touching one of the rolled cinnamon rolls; fold ends under and shape into bunny ears. Pinch dough to secure. Arrange raisins and almonds to look like eyes, noses and teeth. Bake at 400 degrees for 15 minutes, or until golden. Makes 6.